Front steering - Bi-directional - Hydrostatic 87HP. 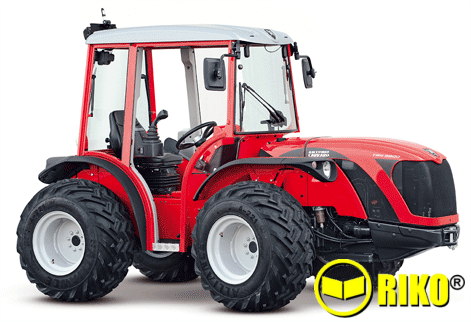 TRH 9800 is the “large reversible hydrostatic” AC tractor fitted with the new 87hp engine (4 cyl. turbo, 3300 cc, featuring balance shafts with electronic governing and electronically-controlled EGR, now even more reliable thanks to the Clean Fix™ system – a reverse flow fan that assures the constant cleaning and efficiency of the radiator and the front grille of the bonnet). TRH 9800 presents new bodywork, consistently with the family feeling of the recent Ergit 100 series. The TRH driving concept is ergonomic and spacious and assures maximum comfort even for large drivers. The ESC (Electronic Speed Control), an electronic and automatic speed and engine rev control device, is also a new addition. 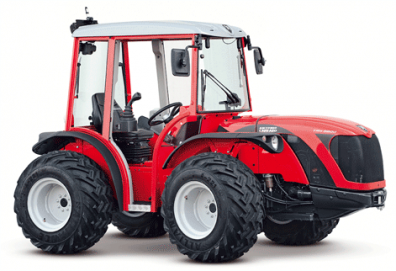 The electrical and hydraulic systems have also be optimised and the new suspension lift and the Multifunction Joystick JM with double oil capacity are both optional extras. As well as the joystick, the wide range of optional accessories includes a front lift and a bull-bar for the bonnet. On request, the TRH can be fitted with the new spacious and comfortable Starlight cab, assuring a perfect work environment and maximum safety, even on steep slopes, the hydraulic suspension and the half cab with 6 uprights. It is ergonomic, comfortable, safe and moderately-priced.